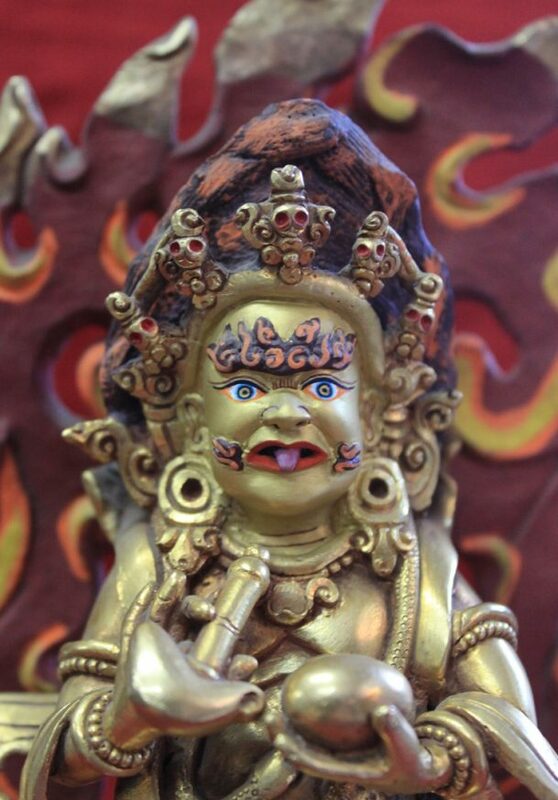 Highest Quality Mahankala Wrathful Deity which is finely carved by Newar Artisans in Nepal. 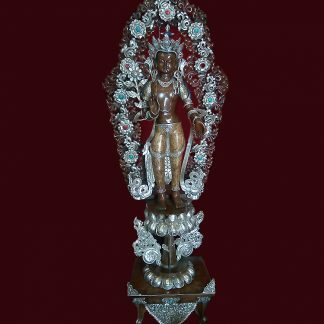 Size: 8.5 X 5 inches tall seated on a lotus base. 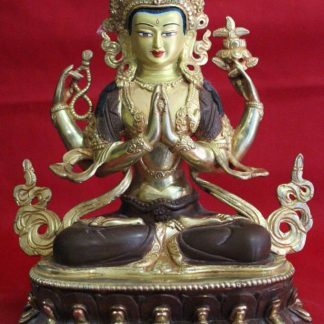 This Gold Buddha Statue is one of the famous wrathful Buddha statues worshiped in Tibetan Buddhism. 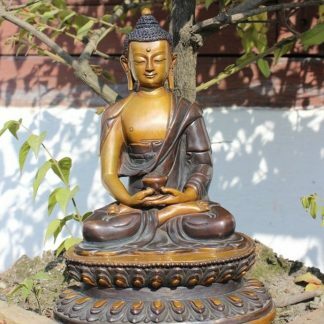 Suitable to keep in your Buddhist Meditation Altar, decorate in living room, place in altars of monasteries, dharma centers and even in places like garden,Yoga Centers and Hotels for decoration. 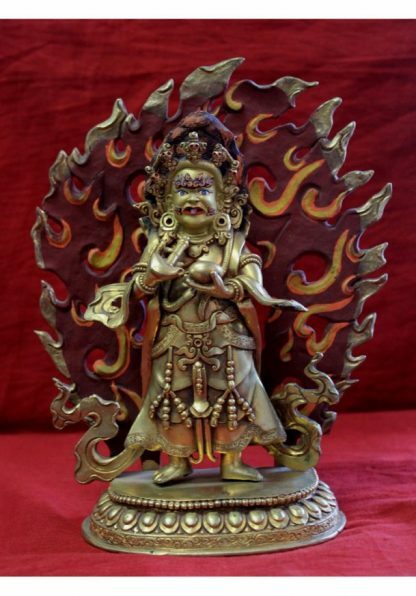 Mahankala is a wrathful deity worshiped in Tibetan and Nepalese Buddhism. It is the Buddhist pantheon with ornaments of snakes, canine teeth, protruding belly and dressed in tiger skin. He is originally dark blue in color. He carries trisula and kapala in his two hands. But in this statue it is simply fully gold plated and equipped with ornaments. He may have one face with two, four or six arms or eight faces with sixteen arms. 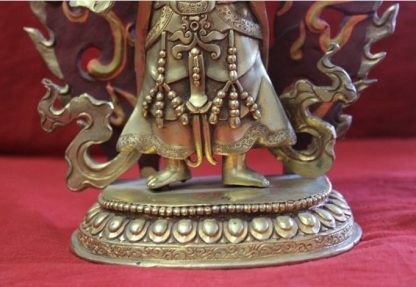 As he is the defender of law, he is given a good position at the entrance doors of Buddhist Shrines. Ancients treat him as guards for the temples and monasteries. You may also check other Tibetan deities here. 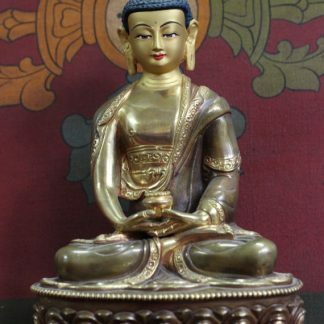 Buddha statues with various positions are made particularly to educate certain concept of the Buddhist philosophy. 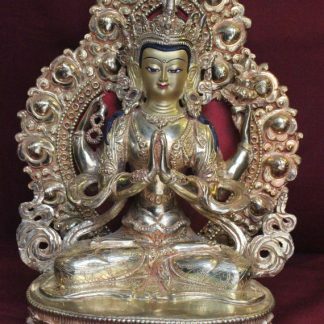 There are various types of them like Standing Buddha, sleeping Buddha, laughing Buddha, blessing Buddha, meditating Buddha, teaching Buddha etc. 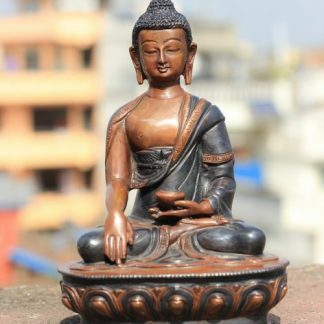 Different positions from the statues hold different meanings and teachings. 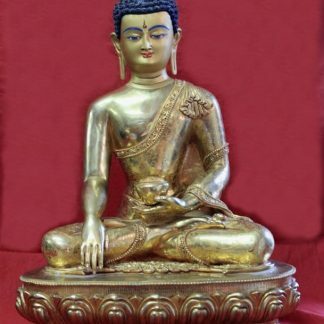 You need to understand these postures to buy buddha statue.